(Nanowerk News) The University of Delaware has won a $4.4 million grant from the U.S. Department of Energy's Advanced Research Projects Agency (ARPA-E) to lead a multidisciplinary, multi-institutional research project to develop the next generation of high-performance permanent magnets. Stronger magnets are essential for increasing the energy efficiency of electronics, automobiles, information technology, and communications systems in the 21st-century, and for supporting the development of hybrid/electric vehicles, wind turbines, environmentally friendly transportation systems, and new energy storage systems, among other applications. The UD project is one of 37 selected nationwide by the agency, collectively totaling $151 million, which "have great potential to revolutionize the U.S. energy sector," according to Shane Kosinski, ARPA-E's acting deputy director. They represent the first round of projects funded under ARPA-E, which is receiving $400 million to deploy under the American Recovery and Reinvestment Act. George Hadjipanayis, the Richard B. Murray Professor of Physics and chairperson of the Department of Physics and Astronomy at the University of Delaware, is the principal investigator on the project. He will coordinate a team of chemists, material scientists, physicists, and engineers from the University of Delaware, University of Nebraska, Northeastern University, and Virginia Commonwealth University; the U.S. Department of Energy's Ames Laboratory at Iowa State University, in Ames, Iowa; and the Electron Energy Corporation in Landisville, Pa. According to Hadjipanayis, the strongest permanent magnets today are made from an alloy of three elements: neodymium (Nd), iron (Fe), and boron (B). Hadjipanayis was one of the three researchers who discovered the Nd-Fe-B magnets in the early 1980s. In the new project, he and his team will be working to identify new materials that will result in magnets twice as strong as those currently in existence. "This is the first time that such a large concerted effort will be undertaken in the U.S. on the development of high-energy magnets that involves the best expertise available in our country on this type of materials," Hadjipanayis said. An article in the Sept. 11, 2009, edition of the journal Science reported that the demand for Nd-Fe-B magnets is growing at about 15 percent per year, for use in products ranging from magnetic resonance imaging machines, to cell phones, headphones, and even prototype magnetic refrigerators. Yet neodymium (Nd), which is a member of the rare earth metals on the periodic table of the elements, is growing increasingly scarce. The UD-led team will explore three different routes over the three-year project, Hadjipanayis said. The first route will be to discover new materials in tertiary rare earth-transition metal-element X systems that have not yet been explored due to synthesis difficulties such as vapor pressure, high reactivity, toxicity, or their refractory nature. 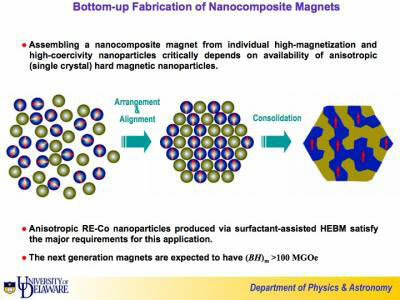 The second route will be to develop materials that are free of rare earth metals and stabilized by the addition of small non-magnetic atoms (Fe-Co-X); and the third route will be to use the bottom-up approach to develop high-energy nanocomposite materials consisting of a uniform and nanoscale mixture of high anisotropy hard (Nd-Fe-B) and high magnetization soft (Fe) magnetic phases. "We hope our efforts will provide the fundamental innovations and breakthroughs which could have a major impact in re-establishing the United States as a leader in the science, technology, and commercialization of this very important class of materials," Hadjipanayis said. More than 3,600 concept papers were received in response to the first ARPA-E solicitation, from which the U.S. Department of Energy requested 300 full applications and ultimately selected 37 based on rigorous review and evaluation.